A team of dedicated and experienced volunteers is ready to lead the children's program. Everyone over the age of 15 may participate in all the convention's lessons, workshops and activities if they wish. No separate services will be provided for everyone over 15. The children's program will be available only for children over the age of 5, and under 14. Children aged 4 and under will need to be accompanied by a parent or guardian. The children's program will consist of indoor and outdoor group activities, creative art projects, exciting learning experiences, sports and games. Children will need to sleep at the hotel with one or both parents. Children will have meals together with their parents and the children's program group. A special children's menu will be available for any children who would like it. It will be the parent's responsibility to watch over the children at all times other than during lessons and other planned activities outside of the children's program schedule. Parents must sign a waiver to admit their children into the program. Please indicate during your registration if your children will participate, or write to newyork@kabbalah.info if you have any questions. Please, note that if your child participates in the program, you are required to participate as well and cover one or two of the shifts along with other guides. No medical services will be provided at the convention by the organizers. Participants must insure they have the proper medical insurance. Hudson Valley Resort is located in Catskills mountains, north of New York City within approximately 90 minutes drive. Participants from outside of the USA may require a visa. Please check if you need a visa on the US Department of State website. If you require a visa, please contact us as soon as possible for an official invitation letter. Transport will be provided from Newark Airport to the convention location all day Thursday, and half a day on Friday. It is approximately a 2 hour drive from Newark Airport to the convention location, so it is recommended to arrive at Newark before 5:00pm on Thursday. Those flying into JFK, La Guardia or any other airport, have to either arrange their own transportation to the convention location, or use public transport to get to the shuttle buses at Newark airport. Click here for information on how to get to Newark Airport from neighbouring airports. The convention officially ends on Sunday, 9 May, 2010 at 3:00pm. The best time to schedule your flight out is after 5:00pm to allow for travel and airport check in. New York State Thruway (I-87) north to exit 18-New Paltz. Turn left on Rte. 299. Go 6 miles to the end & turn right on Rte. 44/55. Go 8.5 miles; turn right at the sign for Hudson Valley Resort onto Lower Granite Rd. Go one mile to the stop sign and turn left. Hudson Valley Resort is 1/2 mile ahead on the left. New York State Thruway (I-87) South to exit 19-Kingston. Take Rte. 28 (Pine Hill) to Rte. 209 South (Ellenville). Go 18 miles & turn left on County Rte. 27 in Accord. Go. 0.2 miles, turn right onto Granite Rd. Hudson Valley Resort is 2.3 miles ahead on the right. Rte. 17 West (future I-86) to Exit 113-Ellenville/Wurtsboro. Turn right onto Rte. 209 North. Continue 6 miles past Ellenville & turn right onto Rte. 44/55. Go 1.5 miles & turn left at the sign for Hudson Valley Resort onto Lower Granite Rd. Go one mile to the stop sign and turn left. Hudson Valley Resort is 1/2 mile ahead on the left. Rte 17 (future I-86) East to exit 113-Ellenville/Wurtsboro. Turn left onto Rte. 209 North. Continue 6 miles past Ellenville & turn right onto Rte. 44/55. Go 1.5 miles & turn left at the sign for Hudson Valley Resort onto Lower Granite Rd. Go one mile to the stop sign and turn left. Hudson Valley Resort is 1/2 mile ahead on the left. Please notify us if you are planning to take the bus or train from New York City so we can arrange your pickup at the Coach USA Short Line bus stop in Kerhonkson, NY (6337 Rt 209, by Sunoco Mart) or at Metro North train station in Poughkeepsie, NY. The bus will arrive in Kerhonkson in 2hrs 30min. Take a Metro North train to Poughkeepsie ($17.75 one way - weekday). Trains run hourly. Travel time is approximately 1hr 30min. You're invited to join friends from all around the world to discover a new reality together. The World Zohar Convention 2010 is an intensive 3 days of studies & workshops on The Zohar and Kabbalah with Dr. Michael Laitman & the Bnei Baruch Kabbalah Education & Research Institute, open for all who wish to sense what the eternal, complete reality is really like. Who? 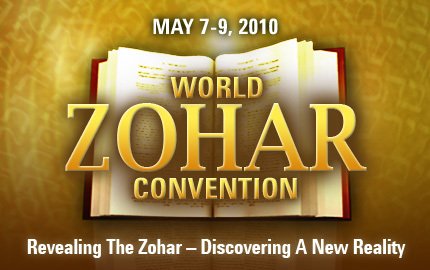 The World Zohar Convention 2010 is for anyone with a desire to change oneself and better the world we live in. Kabbalah students currently studying via the Bnei Baruch Kabbalah Education Center or through Kabbalah TV or the Kabbalah Academy are especially welcome. If you are planning to travel to the World Zohar Convention from outside North America, you may likely require a visa for your stay. The following is information to help ease your visa application process. The US Department of State, who are responsible for visas, have provided us with the following guidelines for all our guests, so please read on carefully. First, if you already have a visa, or are in a country whose residents do not require a visa, you can stop reading. Second, whether you are 100% confident you will be attending the convention, or whether you are just thinking of going, it is recommended to start this process because it takes a while. Since the World Zohar Convention is less than three months away, we want to stress the urgency of this matter: You must apply for a visa as soon as possible. You are applying for a Business (B-1) Visitor Visa. Schedule an appointment at your local embassy. Each country's embassy has its own set of rules, so please check with your country's embassy on how to apply for a visa. Do this ASAP. In response, you will receive an invitation letter, and a few other documents that you will need to take with you to your appointment at the embassy, as well as instructions on how to proceed during the interview. Please write to newyork@kabbalah.info or call 1800-540-3234 if you have any questions, comments or concerns. We may overfill the capacity of the hotel at the convention site. If this happens, then we have an alternate hotel to accommodate all who register. Rooms at the convention site will be assigned on a first come, first served basis, according to when complete payment has been received. Includes 8 lessons, 9 meals (starting with evening snack on Thursday), and 3 night stay at the hotel. Includes 7 lessons, 7 meals (starting with lunch on Friday) and 2 night stay at the hotel.